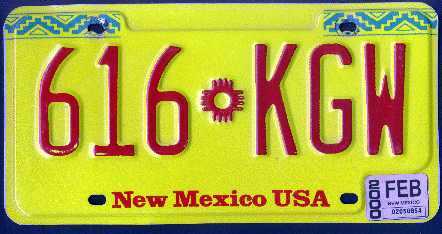 What's this I hear about New Mexico going to two automobile license plates? If it ain't bad enough that we're gonna get more than one area code, now we gotta consider getting all cosmopolitan by stickin' another license plate on the front of our cars. What's next, High Occupancy Vehicles lanes? Light rail? Thai restaurants in the South Valley? I'm afraid NM is losing that inefficient, podunk feel that brought many of us here in the first place. It's like those East/West Coasters moving into the desert and trying to plant ivy plants and madrona trees all over the place. I can feel our Southwestern Hick atmosphere slipping away like a stupid teenager in a flooded arroyo. Thankfully, we haven't turned all HOV lanes and pad thai yet. As I've mentioned before, NM has a stunningly high number of folks who not only don't have two license plates on their car, they don't even have one metal license plate. Instead, there is a piece of paper illegibly stuck inside their dark-tinted rear window. Or, they don't got nothing. No distinguishing license plate number A Tall, paper or plastic or metal. I know this ain't a huge revelation, but large swaths of New Mexico are gentrifying, with all the good, bad, ugly and snobby that comes with it. In my personal heart of hearts I have to admit that I think the good outweighs the bad/ugly in the gentrification equation here. At the same time, riding my bike in the early morning through parts of town still largely untouched by Starbucks, Thai restaurants and mixed-use lofts painted in pastel colors is pretty darn cool. It's like taking a long trip without the passport and confiscation of your tootpaste. Well, it's cool until I almost get run over by a car with an illegible paper license plate. That's when I immediately start day-dreaming about a light rail station in the South Valley with gourmet coffee shop, Thai restaurant, and wine bar attached. I buy that morning's New York Times while I wait the two-three minutes until my train arrives, and gnosh on samples of cherry blintz while sipping an organic Sumatran-French roast blend. I make a quick reservation for that evening at the Thai restaurant using the public-accessible wi-fi laptops at the station, plunk my bike on the train and look at all the new crawling ivy and madrona trees that line the route where the car salvage yards used to be. Actually there is a Thai restaurant in the South Valley but I bet you knew that. No! I didn't know! Please tell us forthwith...I'll be there before the week is out. Oh yes, light rail is coming (if the mayor has his way). And I'm sure the two-plate thing is so the red-light cams can give more tickets to morons who don't know how to drive. As far as South Valley station goes, you should've seen some of the proposals from M.Arch students at UNM for the Railrunner station there...it's yuppie heaven. another great, scot. it's nice to read your writing again.